As if there weren’t enough streaming video boxes to choose from already, the co-founders of TiVo are stepping into the ring with Qplay. 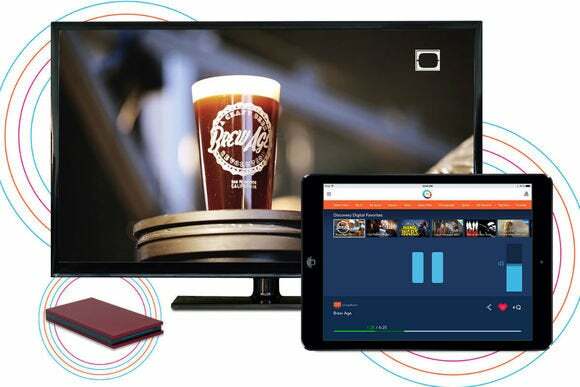 Qplay is a small, $50 set-top box that you plug into a television and control through an iPad app. Similar to Google’s Chromecast, Qplay doesn’t receive any video from the app. It merely receives instructions on what to stream, so users can exit the app or shut down the iPad once the video starts rolling. The interesting thing about Qplay—besides the fact that it’s spearheaded by TiVo founders Mike Ramsay and Jim Barton—is that it’s designed for passive viewing. Instead of just picking a single video, you can choose a playlist, or “Q,” that strings multiple videos together. Qplay generates its own playlists based on genres, friend activity, and other signals; users can also create and share their own Qs. The list of video sources for Qplay is small, with just YouTube, Vimeo, Facebook, Twitter, Vine and Instagram supported, but eventually Qplay wants to add premium video services such as Netflix and Hulu Plus, according toseveral reports. For now, Qplay says it’s in the “early adopter” phase, calling the $49 price tag a limited-time discount. Certainly, Qplay is solving a problem with streaming video on your television: Compared to traditional pay TV, it’s too difficult to sit back and relax, because you must constantly decide what to watch next. While Netflix can automatically load the next episode of whatever TV show you’re watching, it doesn’t offer playlists or any other way to put videos on auto-pilot. YouTube has its own user-created playlists, but the service isn’t really designed around finding and watching them. Qplay is trying to make streaming video as easy to watch as a TV channel. Will it work? That depends on how thoroughly Qplay can integrate premium video services—not just Netflix and Hulu, but offerings like HBO Go, Amazon, and Crackle. It’s also hard to shake the feeling that Qplay would work better as a service for existing devices, rather than another box to add to your entertainment center. If you’re undeterred by Qplay’s current limitations, you can order one now, with devices shipping on a first-come, first-served basis.